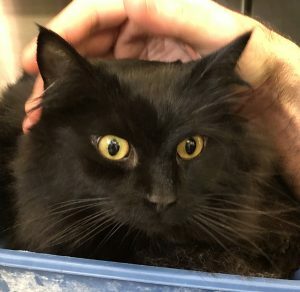 AGE: Sebastian is a 3-year-old plush handsome black kitty who was surrendered after his owner died. PERSONALITY: He was originally bewildered in his new surroundings, but now is coming forward for affection and regaining confidence. He steps out of his kennel when all is quiet, and loves to be petted around the neck and chin. It is heartening to see how he is beginning to trust again. HIGHLIGHTS: Sebastian has lived indoors only and, undoubtedly, his sweet nature will blossom once he is nestled in a quiet home with patient owners. Probably a home without children or dogs would suit him best. COST: Sebastian’s adoption fee is only $50, and includes a free wellness visit at a local veterinarian office. Sebastian is neutered.